Table salt is one of the most common household chemicals. Table salt is 97 percent to 99 percent sodium chloride, NaCl. Pure sodium chloride is an ionic crystal solid. However, other compounds are present in table salt, depending on its source or additives that may be included before packaging. In its pure form, sodium chloride is white. 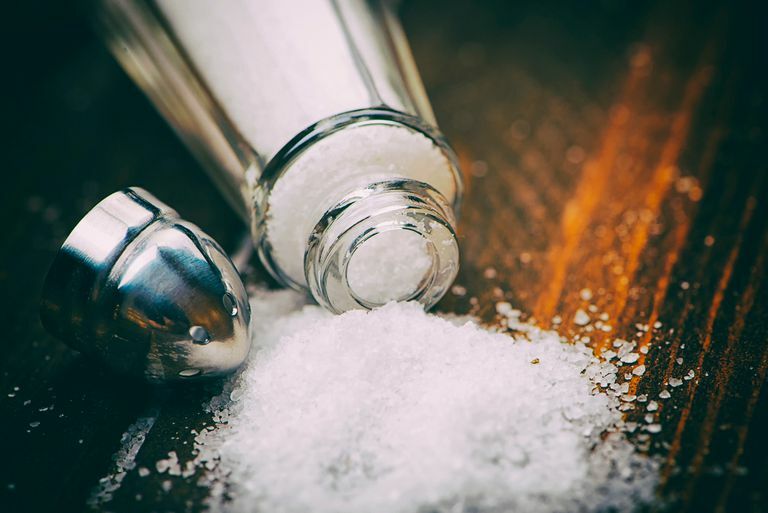 Table salt may be white or may have a faint purple or blue tinge from impurities. Sea salt may be dull brown or gray. Unpurified rock salt may occur in any color, depending on its chemistry. One of the main sources of table salt is the mineral halite or rock salt. Halite is mined. The minerals in mined salt give it a chemical composition and flavor unique to its origin. Rock salt commonly is purified, since halite occurs with other minerals, including some that are considered toxic. Native rock salt is sold for human consumption, but the chemical composition is not constant and there may be health risks from some of the impurities, which can be up to 15 percent of the mass of the product. Another common source of table salt is evaporated sea water. Sea salt consists mainly of sodium chloride, with trace amounts of magnesium and calcium chlorides and sulfates, algae, sediments, and bacteria. These substances impart a complex flavor to sea salt. Depending on its source, sea salt may contain pollutants found associated with the water source. Also, additives may be mixed in with sea salt, mainly to make it flow more freely. Whether the salt source is halite or the sea, the products contain comparable amounts of sodium, by weight. In other words, one cannot be used in place of the other to lower dietary sodium. Natural salt already contains a variety of chemicals. When it is processed into table salt, it may also contain additives. One of the most common additives is iodine in the form of potassium iodide, sodium iodide, or sodium iodate. Iodized salt may contain dextrose (a sugar) to stabilize the iodine. Iodine deficiency is considered the biggest preventable cause of mental retardation. Salt is iodized to help prevent cretinism in children as well as hypothyroidism and goiter in adults. In some countries, iodine is routinely added to salt (iodized salt) and products that do not contain this additive may be labeled "uniodized salt," Uniodized salt has not had any chemicals removed from it; rather, this means supplemental iodine has not been added. Another common additive to table salt is sodium fluoride. Fluoride is added to help prevent tooth decay. This additive is more common in countries that don't fluoridate water. "Doubly-fortified" salt contains iron salts and iodide. Ferrous fumarate is the usual source of iron, which is added to help prevent iron-deficiency anemia. Another additive may be folic acid (vitamin B9). Folic acid or folicin is added to help prevent neural tube defects and anemia in developing infants. This type of salt may be used by pregnant women to help prevent common birth defects. Folicin-enriched salt has a yellowish color from the vitamin.